Love these lamps, great quality and looks fabulous in our family room. Safavieh Lighting 20.5-inch Delia Faux Snakeskin Cream Table Lamp - 15" x 8" x 20.5"
Safavieh Lighting 20.5-inch Delia Faux Alligator Cream Table Lamp - 15" x 8" x 20.5"
An auction catalogue with vintage lots from the office of one of Hollywood s infamous studio executives inspired this modern table lamp. 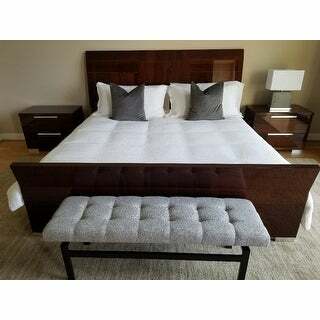 Sleek and stylish, its rich grey hue, faux croc texture and luxurious silver finish make it an instant blockbuster. Dimensions 15" X 8" X 20.5"
The lamps are pretty well made & beautiful. I love the patterns of the faux alligator base. It looks elegant & interesting. The grey color looks just like in the photo. The shade is pure white. The clean, simple lines, together with the easy-on-the-eye, neutral color, bring a contemporary, yet calming feel to the room. For the price, this is a very good deal! I bought this lamp for my bedroom, which has shades of gray and teal, and it looks great! I love the base and the shade, and even the cord, which has a fabric type of wrap around it. I didn't realize it came with a bulb, which was a nice surprise. It definitely looks like I spent much more money on it than I did (my husband actually compained when he saw it, even though he liked it, because he assumed I spent a ton of money). It definitely adds a unique, chic touch to the bedroom. I highly recommend this lamp! It's beautiful! I loved these lamps so much that I bought two sets for both my guest bedrooms. I purchased a set in grey and a set in cream. Very good looking, good quality lamps. Love this table lamp. Very expensive looking. These lamps are beautiful and they look great they also come with the shade and the bulb they are good quality for the money love them. Great lamp for my entryway table. Very high end looking. I love it! Love the lamp. it goes well with the glass panel nightstands (also purchased on Overstock). I ordered two lamps and unfortunately one of them appeared to be a return since it was not packaged in the original box and was partially assembled. I contacted CS immediately and the young lady who assisted immediately apologized and processed a replacement. Love this lamp I also have a tall lamp same design but purchase from a different vendor. I love it . This is a very nice lamp. Well designed. Love this lamp. Even the cord is a high-quality fabric surround. Such a nice, muted shade of gray/green. An excellent addition to my living room. Nice lamp although the switch was rusted. Customer service was great sent a new lamp right out. Couldn't be happier with this purchase. Quality is excellent. "Just one table lamp or is it a set ?" This is one table lamp only. "Curious to know if you can use LED bulbs? The description references CFL." This comes with CFL bulbs and these are what are recommended for this product. "Is the base 15" alone or the total 15" include the base as shade Please Help." This lamp has a height of 20.5” including the shade. "I need to know if the base of the lamp is 15" or is the base with the shade is 15" all together Please Help. " 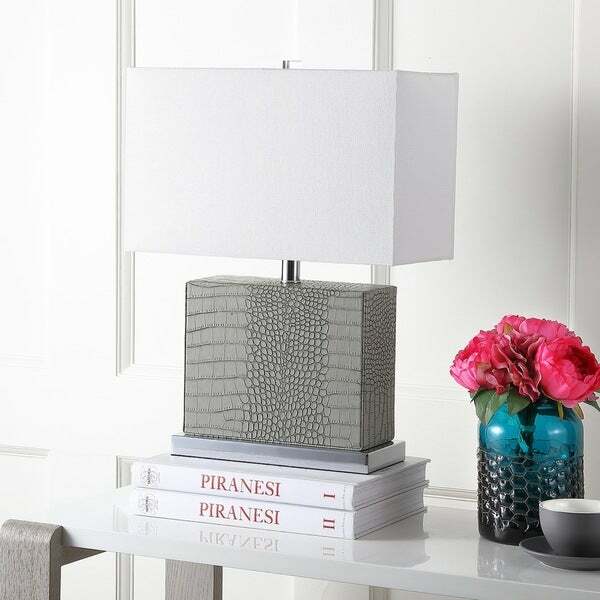 Safavieh Lighting 27.75-inch Joyce Faux Woven Leather Grey Table Lamp (Set of 2) - 18" x 8 " x 27.75"
Safavieh Lighting 27.75-inch Joyce Faux Snakeskin Cream Table Lamp (Set of 2) - 18" x 8 " x 27.75"